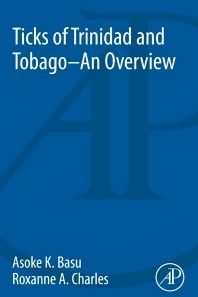 Ticks of Trinidad and Tobago: An Overview explores tick species prevalent in Trinidad and Tobago (T&T), their distribution, associated pathogens, their effects on the host, and control methods. The book also reviews the basic biology of ticks. Ticks are known to parasitize a wide range of hosts including mammals, reptiles and birds. These parasites are of veterinary and public health significance since they are responsible for the spread of a number of pathogens to humans and animals. Worldwide, ticks are responsible for billions of dollars in losses in the livestock industry annually due to the effects of these pathogens. Based on review of the literature from more than five decades, twenty-three species of both hard and soft tick have been discovered on the twin-island republic with a greater number of species in Trinidad. Tick genera observed and recorded included Argas, Ornithodoros, Amblyomma, Dermacentor, Haemaphysalis, Ixodes, and Rhipicephalus species. The tick species found in Trinidad and Tobago parasitize both wild and domestic species. Hosts include bats, fowl, equids, wild and domestic ruminants, birds, rodents, marsupials, and a variety of reptiles such as toads, tortoises, and snakes. Based on geographical location, most tick species discovered in T&T have also been recorded in other Caribbean islands in the archipelago, North, Central and South America. Both soft and hard tick species found in T&T have also been implicated in a number of blood-borne pathogens including Borrelia, Ehrlichia, Babesia, Hepatozoon, Rickettsia, and Anaplasma. Professor Asoke K Basu obtained his BVSc & AH degree in 1973 from University of Calcutta; MVSc (Veterinary Parasitology) in 1981 from BC Agricultural University; and was awarded PhD in 1988 from University of Kalyani, India. Over the years of his research career since 1978, he worked on different ectoparasites such as tsetse fly, ticks, lice, mites, nasal bot fly as well as endoparasites, primarily gastrointestinal helminths and blood parasite, Trypanosoma of animals in India, Nigeria, and Ethiopia. While Professor Basu was engaged in bionomics of ticks and their control in the aforementioned countries, he has been presently working on biology of ticks prevalent in Trinidad & Tobago for last eight years at The University of the West Indies, St. Augustine. He has published more than sixty research papers in various journals. Dr. Roxanne Charles began her research career in 2006 with a Veterinary Science background. She was a recipient of a Fulbright Scholarship (2009) . Her research is primarily involved in wildlife and domestic species with a focus on parasitic infections caused by Trypanosoma cruzi, gastrointestinal helminths, Toxoplasma gondii, and ectoparasites. She joined her alma mater (The University of the West Indies, St. Augustine), in 2011 as a faculty member in The School of Veterinary Medicine, where she is involved in teaching and research in various areas related to parasites.